With today's 90 degree temperatures expected around the region, it's important to note that highs today will be around ten to twelve degrees above average. Yep, the average high is around 80 these days...we have a long ways to go before we hit rock bottom in the temperature department but in four months we will be at our coldest points of the year. This quick shot of heat that's around today, along with the humidity that hangs through tomorrow, is not long lasting. A cool front slides through the region tomorrow evening and tomorrow night. While Friday *may* still be a bit mild -- modeling has waffled a lot between a milder day and cooler day for temperatures, much lower humidity will push in on the strength of northerly winds. The kicker will be what temperatures drop off to on Saturday morning. Lower and middle 50's in the immediate city. 40's north and west of town...perhaps lower 40's in Allentown and Reading. This with a northerly breeze that will continue through the evening hours, adding additional chill to the air through the night. Dare we say we might have a bit of a wind chill on Saturday morning in parts of Pennsylvania and North Jersey? It won't be frigid by any stretch but the combination of coolness and breeze will definitely result in a fresh start to Saturday through the region. For many, having swung from 57 to near 90 in 36 hours, the swing back from near 90 to the low 50's over a 36 hour stretch from Thursday afternoon to early Saturday may have a few of you wondering what's going on. 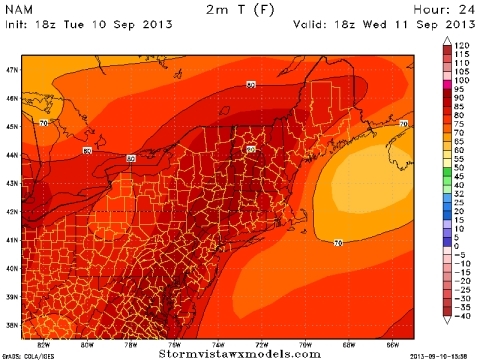 It's September...and heat events are fleeting and in conflict with incoming chill. That chill will increase in frequency and duration over the coming weeks and months...so these intrusions now are subtle reminders that summer is leaving us.